The major figure of American abstract expressionism, Pollock created his best works, his famous drips, between 1947 and 1950. After those fascinating years, comparable to Picasso’s blue period and Van Gogh’s final months in Auvers, he abandoned the drip but continued to paint expressively. About the artist: Jackson Pollock (1912 – 1956) was an American painter and a major figure in the abstract expressionist movement. He is best-known for his unique style of drip painting. During his lifetime, Pollock became a major artist of his generation, and he enjoyed considerable fame and notoriety. Regarded as reclusive with an unpredictable personality, Pollock struggled with alcoholism for most of his life. In 1945, he married the artist Lee Krasner, who became an important influence on his career and on his legacy. Pollock died at the age of 44 in an alcohol-related car crash. 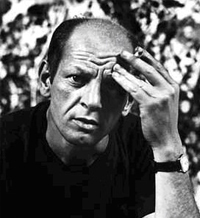 In December 1956, four months after his death, Pollock was given a memorial retrospective exhibition at the Museum of Modern Art (MoMA) in New York City. In 1998 and 1999, his work was honoured with large-scale retrospective exhibitions at the MoMA and at The Tate in London.